Here are a few clarifications and expansions of ideas presented in the EBFA webinar, Spring Loaded: Assessing the Knee Through Tibial Rotation. I mentioned that, because I have a martial arts background, I owe a lot of my understanding of how ligaments work to joint locks used in close combat. Joint locks are not necessarily used to break joints, as it sometimes appears. Instead, they are very useful in controlling an opponent, forcing them to move, involuntarily, wherever you direct them. When a ligament is maximally tensioned along its longitudinal axis, its effectiveness at moving whatever bones it is attached to is also maximized, meaning that tiny force going into, say, a certain twist of the wrist, yields a great deal of acceleration in the radius and, by extension, the humerus and then the rib cage and thoracic spine and so on. Ligaments are typically attached to strategic points of leverage on a bone. As a matter of fact, providing leverage for the displacement of a neighboring bone is basically the definition of the role of a ligament. 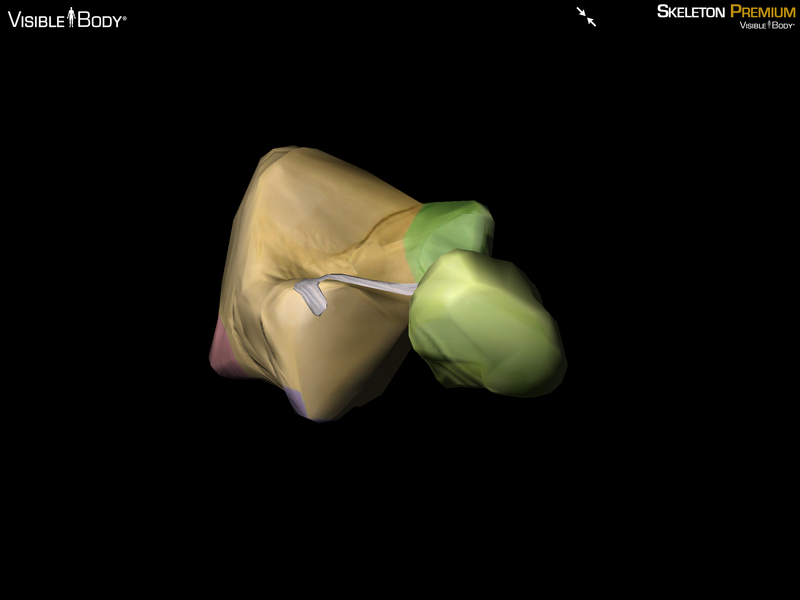 In our example from the webinar, the sustenaculum tali (calcaneus, green) is connected to the medial malleolus (tibia, red) via the tibiocalcaneal portion of the medial ligament (pictured). 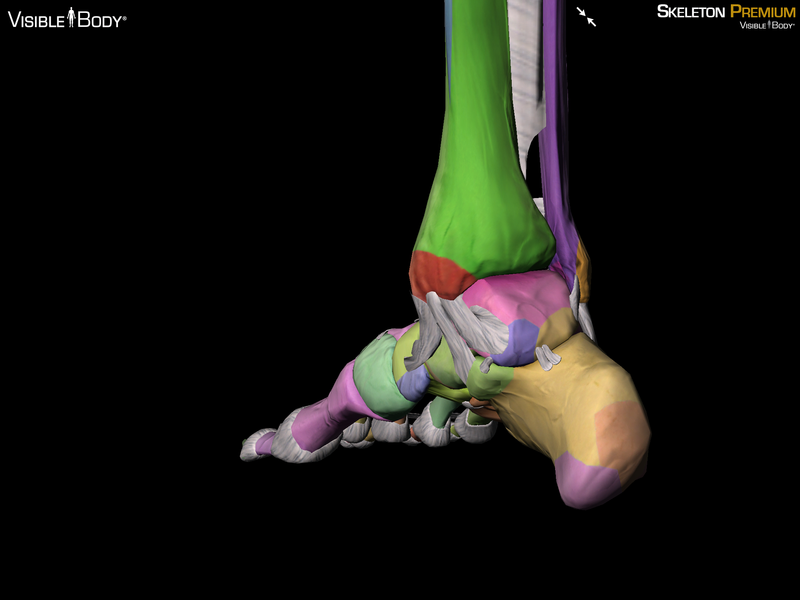 The body of the talus (pink) is connected to the medial malleolus as well, via the posterior tibiotalar portion of the medial ligament. Now, let’s follow the force. At the moment the heel strikes the ground, there is a ground reaction force (GRF) pushing up (and slightly medial) on the calcaneus at the point of contact. The calcaneus, however, is irregularly (and ingeniously) shaped, so that the sustenaculum tali, which protrudes like a shelf medial to the body of the calcaneus, is not being directly acted upon by GRFs. It is, however, still being acted on by gravity. Any lever is defined by three points. The input, the fulcrum (or pivot, if you prefer) and the output. 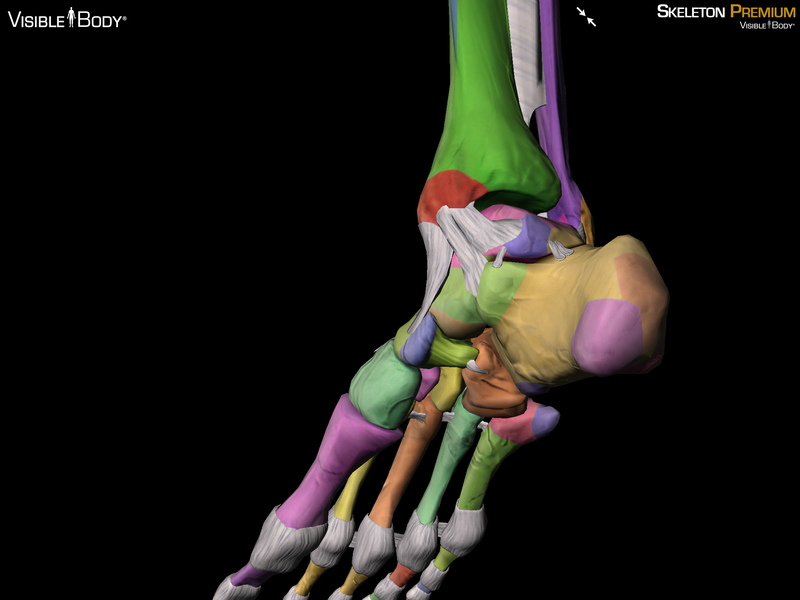 What we see here is the inferior body of the calcaneus acting as the input, channeling ground forces through its structure. The sustenaculum tali, being acted upon in the opposite direction by gravity, is the fulcrum, providing resistance. The attachment point of the tibiocalcaneal ligament, then, is the output, acting on the tibia (via the longitudinal axis of the medial ligament) with a greater force than what was initially introduced, all because of leverage. Now your turn. See if you can identify the input, fulcrum and output points for the movement of the talus and its relationship to the tibia. We can discuss in the comments! We had just a moment to touch on mid-foot running patterns and how, in many, the loss of ground contact with the heel can make it harder to get the eversion moment necessary for proper propulsion. I briefly pointed out the super cool relationship between the navicular bone and the calcaneus, but I wanted to show you some more explicit evidence of that relationship. Here it is, in context, from a slightly superior, lateral view. 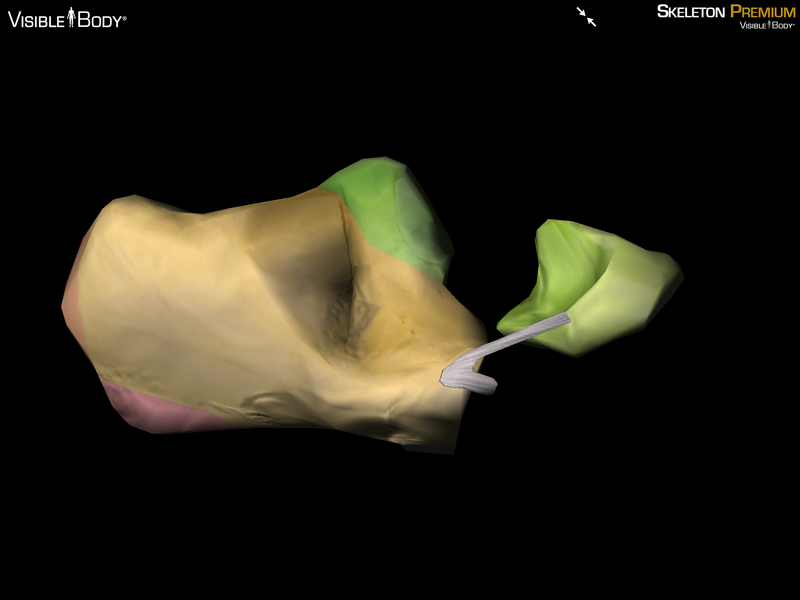 The Calcaneonavicular ligament is the bifurcated one, originating at the calcaneus (yellow) with the longer branch attaching to the navicular bone (light green) and the shorter branch going to the cuboid (light orange). The first view is more anterior than the context view above and shows how steep the angle of pull is between the two actors. The second view is more superior and more lateral, to show the insertion point of the ligament into the navicular bone. This relationship allows the navicular bone to be an alternate input for eversion. The same GRFs that evert the calcaneus upon impact also act upon the navicular bone, if through a slightly more complicated pattern of leverage involving the hallux, the medial cuneiform and the cuboid bones. We could do a whole other webinar or two on that! I want to clarify something I said near the end regarding fitness and rehab methods. When I began putting together the Reembody Method™, I purposefully did not begin by codifying or even recording the specific exercises or manual release techniques that I do with my clients. Not because I’m guarded or protective of my intellectual property—exactly the opposite—because the movements involved in my method are not terribly intellectual. The understanding of the internal relationships that underpin those movements is the meat of the method. There are already tons of codified and choreographed movement styles out there that work just fine. What’s more, they are all necessarily made up of the same basic movements: some hip flexion, some hip extension, some spinal rotation and extension, dorsiflexion and intercostal expansion and so on and so forth. Our bodies all move in more or less the same 3-dimensional space and all of those movements have names and a bell curve of ranges that we all know (or could know, if we looked them up). Movement methods are good or bad based on how well the instructor understands what he or she is teaching. Phyl London likes Pilates, and does it well because she knows why it works. Dr. Emily introduced VCore and has been very successful with it because she knows why it works. Jason Crandell is a fantastic yoga instructor because he understands why it works. The Reembody method, then, is entirely about teaching people why things work. Once you know that, you can do anything. All fascinating, Kevin. And I loved your tag line, explaining the purpose of Reembody. Big “aha” for me. So I really couldn’t answer your challenge to identify the input, fulcrum and output points of the talus, but I’d sure like you to tell me. I’m printing out the range of joint motion evaluation chart right now. Amazing stuff. This is so good to know, and it makes understanding how the body moves really, well, knowable, instead of just this big mystery. In teaching people to sing, it is always amazing for them to realize there are a finite number of pitches any human being can sing, that they only need to learn those pitches in their particular ranges and not EVERY pitch. I feel the same way now about what you’re explaining here — that there are only so many ways the body’s parts can work, and if we know how they work (especially in their most effective usage) we can really own our bodies. I love learning this stuff.